Hi fellow knitters! I am on vacation right now on the Jersey Shore - no, not with Snookie! 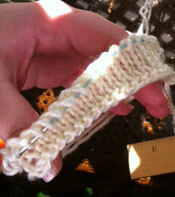 - and working on a beaded scarf using the Milanese Lace stitch from the second Walker Treasury. You can check out my progress on my FaceBook page. (I am Sapphiresn Purls on FB) It's coming along very nicely. Can't wait to finish. Happy Knitting!!! Just thought I would make a little video on adding a crochet border to a knitted item. 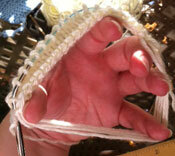 If you aren't a crocheter, don't worry - you can still do this. 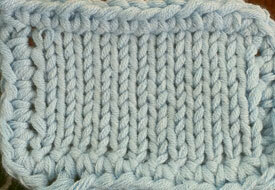 I don't know much about crochet, but this is simple enough for even someone like me. Usually, I add a few extra stitches to my stitch pattern to make a border around my knitting, so that when I bind off, I am done. 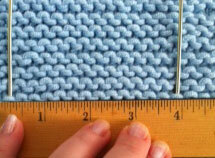 However, if you decide you would like to add a border after the fact, this is an easy way to do it. You should use a crochet hook appropriate for whatever yarn you are using, or, whatever hook looks closest in size to the knitting needle you used for the main part of your fabric. You can use the last loop of your bind off as the starting point for your crochet border, or break the yarn and make the border in another color of your choice.